We'll do the work. You'll reap the benefits! 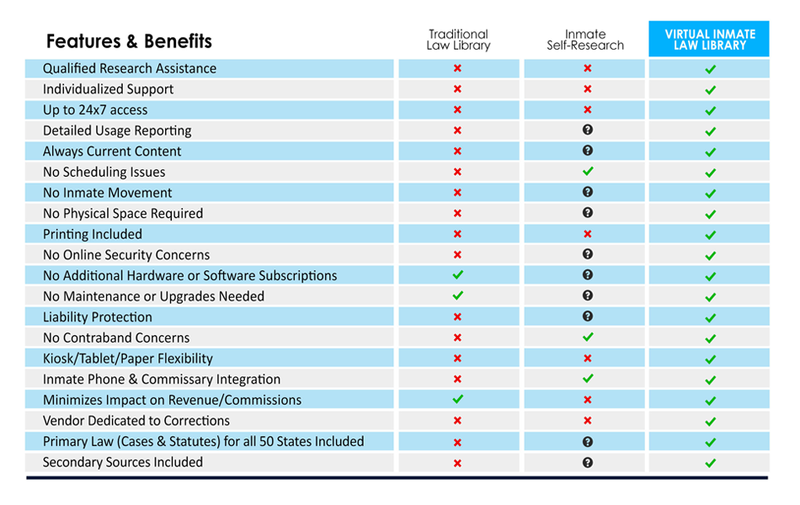 LRA’s full-service program can eliminate the costs of maintaining law books and computers on-site, including the associated costs of the space they now occupy. It can also eliminate the staffing requirements of scheduling and moving inmates. If ever needed, the program also includes errors & omissions liability coverage and response preparation to related grievances. "LRA has saved my agency money and increased the efficiency of operations within the Bureau of Detention. We’ve eliminated the need for large law libraries or on-line subscriptions and it’s no longer necessary to have specially trained staff to research and answer requests for legal material. LRA's staff are professional and responsive and go the extra mile in customer service." "We have been totally satisfied with the service provided by Legal Research Associates. It has really helped the Morgan County Detention Center personnel to make available and supply necessary legal information to our inmates. Your turn around time for requested information by the inmates has been within the promised time frame. We would highly recommend your service to other jails for providing legal research assistance to their inmates." "We are very satisfied with LRA as they have provided services in a timely and cost effective manner and have had very minimal impact to staff." "We had problems making sure we provided the appropriate legal materials in our law library. The costs for legal books and materials continued to increase. We looked at several different options. We went with LRA and have been extremely satisfied. They have provided outstanding service that is affordable and meets the legal requirements." a comprehensive solution to the legal research component of inmates' “access to the courts". LRA has been providing legal research assistance to inmates since 1995, and is still serving their first client. Since there is no inmate scheduling or movement, personnel can be assigned other important tasks. Get rid of the books. Now is the time to go Virtual! Let LRA fulfill inmates legal research requests. Inmate legal research requests are returned to them within 3-business days, printed and ready to use. No more computers, or printers needed. Request forms can be integrated with your Commissary & Telephone Vendors (Kiosks and/or Tablets). In most cases, costs can usually be allocated through your Commissary or Telephone Commissions, or the Inmate Welfare Fund. More time is preserved for revenue generating activities as inmate Kiosk time is minimized. LRA is 100% focused on corrections, and has a long history of providing quality research assistance to inmates. Inmates typically receive much more useful information than they would doing their own research. Opportunities to pass contraband or prohibited communications are reduced. Existing space can be reallocated for other purposes than a law library. The LRA Service can be made available to all inmates at all times (24/7) since there are no scheduling issues. You, too, can have a virtual inmate law library and reap the benefits.